Bringing sports teams to Whistler is a breeze. Winter or summer, there is a range of facilities available to suit all budgets and requirements. Book a trip to Whistler with us and spend less time organizing and more time focusing on your teams preparation and performance. 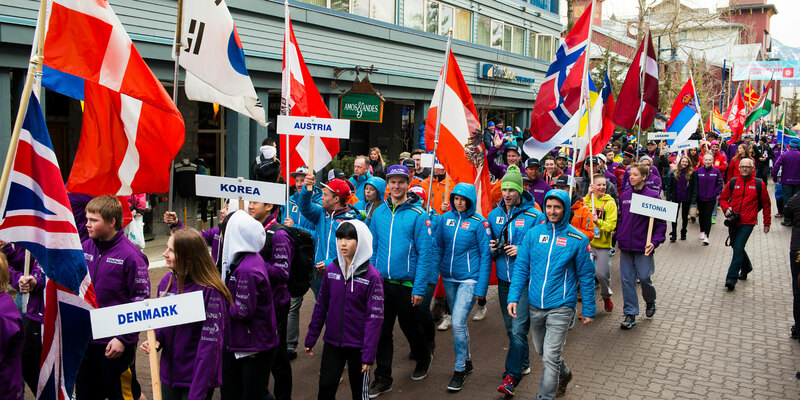 Why choose Whistler to host your sporting group/event? Whistler is Canadas premier year-round leisure destination and provides a true Canadian West Coast mountain experience. With a wide variety of world-class recreational and leisure facilities on offer and a comprehensive selection of accommmodation options available, Whistler is the ideal location for your sporting group or event. Whistler boasts a wide range of "event friendly" indoor and outdoor sporting facilities. No matter how small or large your group is, Whistler has the perfect facility to suit your needs. Please click on any of the facilities below for further information. Serving as a home to the Austrian team during the 2010 Olympic games, the Lost Lake Passiv Haus is located a short walk from Whistler Village. Located amongst 32 kms of winding, diverse, scenic trails, the Passiv Haus serves as the perfect base for a cross country skiing/running, biking and snowshoeing event. Featuring a Gymnasium, meeting space and kitchen, the community centre provides a perfect space for sports and large social events. Located approximately 10 minutes drive south of Whistler, the Spring Creek Community Centre features a full size gym suitable for small sports groups and activities. The School also has a grassy field that can be utilized for a variety of sporting events. The Whistler Blackcomb Air Dome is a fully supervised, 780 square indoor BMX facility with ramps, pipes, wall rides and a foam pit. The dome operates during the Summer months and is located in Parking Lot 8 on Blackcomb Mountain. With over 40,000 square feet of verstile indoor event space, the Whistler Conference centre is a striking mountain lodge in the heart of Whistler. Its an inspiring, friendly and relaxed setting to stage any special event. For further information, see the Whistler Conference Centre website. Whistlers extensive cross country trail network is simply unparalleled. Offering everything from smooth valley trails and logging roads to tight twisty, technical single track. For further information and trail maps, see Whistler Cross Country Mountain Biking. The ultimate gravity-fed downhill biking experience, the Whistler Mountain Bike Park draws mountain bikers from across the world. All levels and abilities are catered for with thee mountain zones, green trails, technical double blacks, jump trails and more - see Whistler Mountain Bike Park for further details. Whistler Disc Golf Course is located at the back side of Lost Lake Park in Whistler, British Columbia. It is a 27 hole course consisting of 18 baskets and 9 tonals. The club operates from snowmelt (generally April) until snowfall (generally November) and plays host to a number of local and provincial tournaments. Located approximately 20 km south of Whistler Village, Whistler Olympic Park features the Olympic and Paralympic Biathlon Range, Ski Jump, picturesque Day Lodge and more than 90 kilometers of cross-country ski trails, expertly groomed for both classic and skate skiing, ranging from beginner to Olympic calibre. Whistler’s Racquet Club is located in Whistler Village and features 3 heated indoor tennis courts, 4 outdoor courts, proshop, exercise room, on-site bar & restaurant and breathtaking mountain views. The Whistler Sliding Centre is home to the fastest ice track in the world. Since hosting the bobsleigh, skeleton and luge competitions during the Vancouver 2010 Olympic and Paralympic Winter Games, the Whistler Sliding Centre continues to challenge the sports’ most elite athletes with international competitions, recruiting camps, and ongoing youth programs. For further information about the club, see Big Sky Golf Club. For further information about the club, see Fairmont Chateau Golf Club. Meadow Park ball fields are located behind the Meadow Park Sports Centre. The facility includes two ball diamonds. Located next to the ball diamonds is the fun family water park, and picnic areas located next to the River of Golden Dreams. Myrtle Philip Community Centre play fields are located next to the Myrtle Philip Community Centre off of Lorimer Road. There are four playing fields and one ball field. Rainbow Park is accessible by valley trail and special bus service, and limited parking is also available. There are picnic tables, BBQ pits, beach volleyball courts, a boat dock and a swimming dock, wheelchair ramp, buoyed swimming area, grassy lawn, picnic shelter, group area and washroom/change room. This venue is excellent for beach volleyball tournaments, swimming and triathlon events. Spruce Grove Park contains three competition quality baseball diamonds, a clubhouse which can be rented for events, a concession and is the start of the Whistler Disc Golf course. There is a large parking area, and the Valley Trail runs past the park. The park is night lit with stadium lights for baseball games. The Whistler Athletes’ Centre (WAC) is one of the 2010 Winter Olympic and Paralympic Games facilities operated by Whistler Sport Legacies, and is the epicentre of athlete training and development in Whistler and the Sea to Sky corridor. The centre caters to high performance and development sport groups looking to stay and train in any season at any venue in the Whistler region. The WAC offers state-of-the-art strength and conditioning resources in addition to short and long term accommodation. The Whistler Athletes’ Centre (WAC) offers two unique, affordable accommodation options, an Athletes’ Lodge and Athletes’ Townhomes. The 97 room Athletes’ Lodge and the 20 Athletes’ Townhomes provide a total accommodation capacity of over 300 beds; ideal for accommodating team training camps and competition events. The Whistler Athletes’ Centre is proud to offer a large number of fully accessible rooms in both the Athletes’ Lodge and the Athletes’ Townhomes. If you are seeking alternative accommodation within Whistler village, our Group Sales Specialist can organise suitable accommodation for you at negotiated group rates. From full-service hotels to fully equipped condomoniums, well use our local knowledge to find the best accommodation for you within your budget. If you would like further information on group accommodation options or would like to make a group reservation, please contact our Group Sales Specialist on 1.866.299.6971 or click to email. From SUV's and passenger Van's to Executive Coaches or Floatplane transfers, we work with our travel partners to provide you with the widest selection of reliable and flexible transportation options. If you would like further information on group transportation options or would like to make a group booking, please contact our Group Sales Specialist on 1.866.299.6971 or click to email.